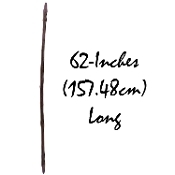 Realistic Faux Wood 62-inch (5-ft 2-inch or 155cm) Long Novelty Walking Staff Stick for Hobbit-inspired costumes, Biblical Nativity scenes, Renaissance Fair, Medieval theme events. Add this amazing prop to a number of different costumes, such as a Native American, Wizard, Warlock, Sorcerer, Witch, Caveman, Steampunk Halloween Cosplay Costume Party Accessory. Brown color tree branch wood grain textured hollow hard molded plastic with black sculptured detailing. Two pieces easily screw together for compact storage. Whether you're a magical wizard on a daring quest or a weary nomad traveling through rough terrain, this huge walking stick will aid you along your journey and make sure that you successfully reach your destination. Become the most powerful sorcerer or the fiercest Native American warrior when you're swinging this big stick this Halloween! *Costume Accessory only- Not to be used for walking support!